Hey Insiders! I recently saw the movie “Trainwreck” written/starring funny girl Amy Schumer. You may know Amy from her stand up comedy or her television show ‘Inside Amy Schumer’ on Comedy Central. If you’re not familiar with Amy, she’s known for her crude raunchy comedy and this movie is no exception. The film was very funny and I don’t typically go for this particular style of comedy. 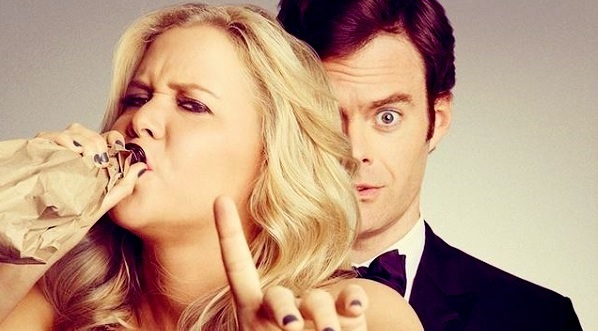 ‘Trainwreck’ follows Amy (which is also the name of the character), a carefree magazine writer living in New York. From a young age, Amy was told numerous times by her nutty father, “monogamy isn’t realistic”. Now in her early 30s, she is living by those words. Amy seems to enjoy her wild, promiscuous life but that is shaken up when she’s writing a profile on a successful Doctor to the athletes, Dr. Aaron Conners (Bill Hader). To Amy’s surprise she starts to fall for the Doctor and starts to wonder if it’s time for her to grow up and get her act together. The movie was very, very funny. I LOVE watching comedies and for the first half of the flick I was belly laughing at every single scene. I was surprised when the tone of the movie changed after the characters endure a tragedy. The film gets sad out of nowhere. I personally didn’t like the drastic tone change, probably because I wasn’t expecting it at all. It was hard for me to shake the sad feeling when the movie tried to get back to funny and light hearted. I eventually did shake the bad vibes and found myself laughing again. Although I didn’t like the tone shift, I do respect the writing a lot and think the movie was excellent. Amy and Bill were fantastic in the movie. They have a great on screen chemistry and did an amazing job bringing the two hilarious characters to life. Amy’s acting range was surprising for me. I’m used to her being a funny, easy going comedian but was shocked when she brought forth real emotions. I liked the movie and recommend seeing it, if raunchy comedy is your thing. It’s not my most favorite movie but it was enjoyable. Keep in mind it gets a little sad in the middle but maybe it won’t bother you as much as it did for me, since you have a warning. If you’ve seen the movie let me know your thoughts by leaving a comment below. Did you hate it? Did you love it? Do you think it was alright? Let me know! Thanks for reading GC! Please follow us on Facebook and Instagram.